When you're working outside, it's important that you get a pair of gloves you can rely on. The Uvex Rubiflex S 40cm Reinforced Chemical-Resistant Gloves NB40S are constructed with a reinforced cotton interlocking liner to provide heat insulation. The gloves are also 40cm in length to protect your forearms. The product code for these gloves is 98902. 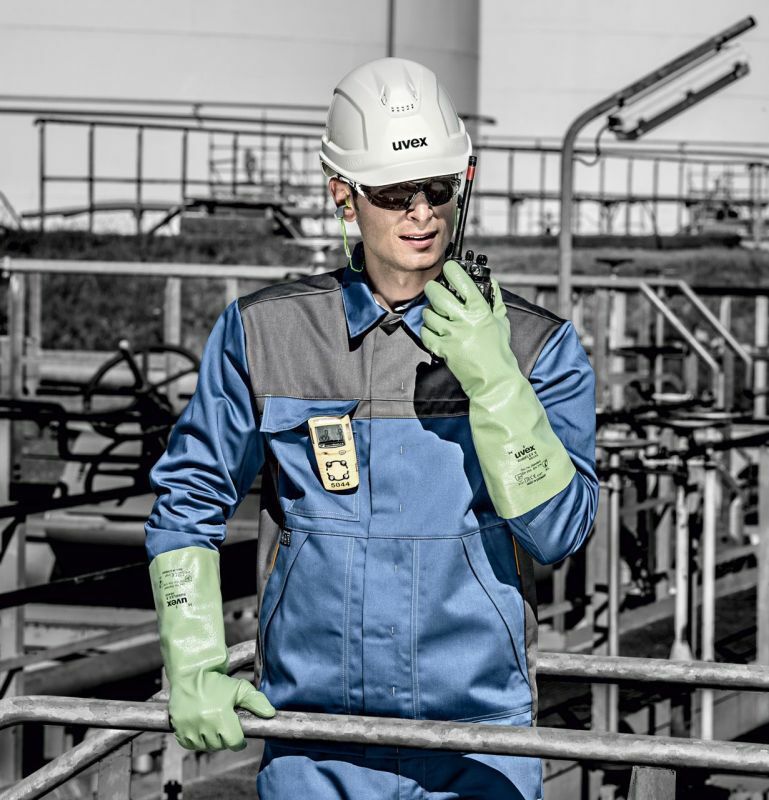 The Uvex Reinforced Chemical-Resistant Gloves have been tested to EN 388, the European standard for gauging how effectively a glove protects your hands against mechanical risks. Please check the table below to find out the results for these gloves. 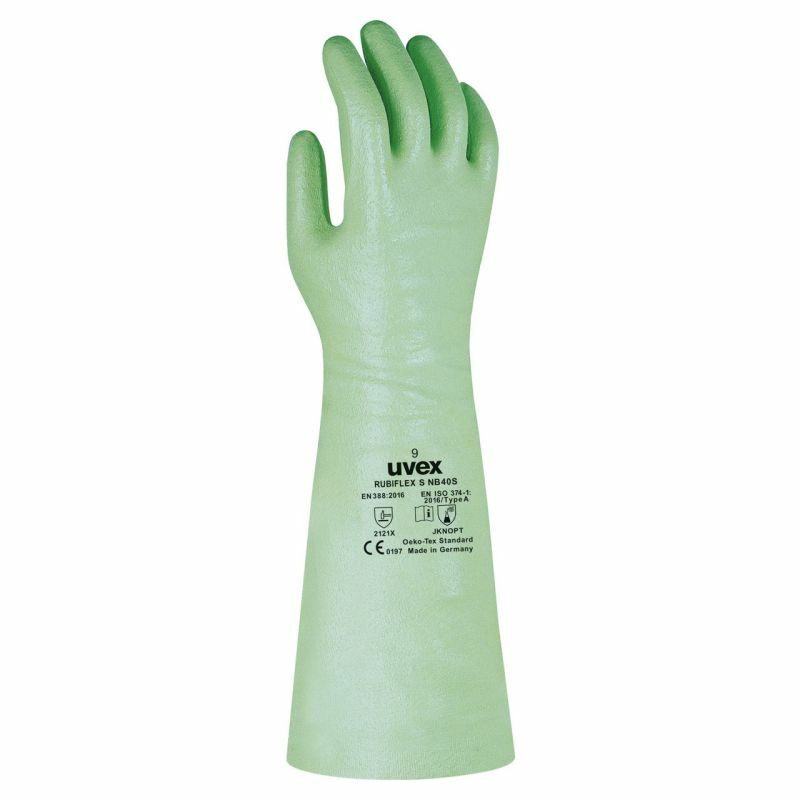 These gloves are suitable for contact with food, including aqueous, acidic, alcoholic, dry and fatty foodstuffs. This makes the Rubiflex NB40S Gloves ideal for tasks such as food manufacture, ensuring that all hygiene protocols are met. The Uvex NB40S Gloves are available in three different sizes. Please measure the circumference of your hand around the knuckles (excluding the thumb) with your hand open and your fingers together, and then refer to the table below to find out which size will fit your hands best. These gloves are 40cm in length for improved forearm protection. The Uvex Rubiflex S NB40S Gloves are fully coated with a special nitrile rubber that's approximately 0.5mm in thickness. This helps improve your grip in tough conditions. Gloves purchased for use in a busy dye house environment. They are fit for purpose, great protection from a range of corrosive chemicals and heat resistant up to 100 degrees C for short periods. Comfortable to wear and handle slippery objects very well. a slight bit of extra thickness and an extra 5cm on the arm length wouldn't go amiss but all in all, these are fantastic and I highly recommend them.